The KIT-1 has been redesigned! The KIT-1 is our basic body frame hardware kit. This is a great kit if you are building a standing prop without the need for adjustable legs. It features adjustable shoulders, elbows, and an articulated spine. The legs are fixed. (1) 1 inch Schedule 40 PVC Tee fitting. (1) 1 inch Schedule 40 PVC Cross fitting (includes pipe adapter and 4 inch length of 1/2" PVC pipe. Fits most foam wig heads). (24) Self drilling TEK screws. 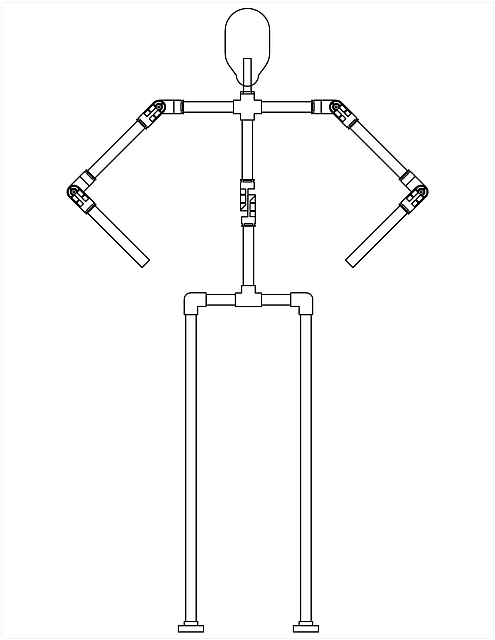 A 6 foot body armature requires approximately 12 feet of 1 inch Schedule 40 PVC pipe to construct.